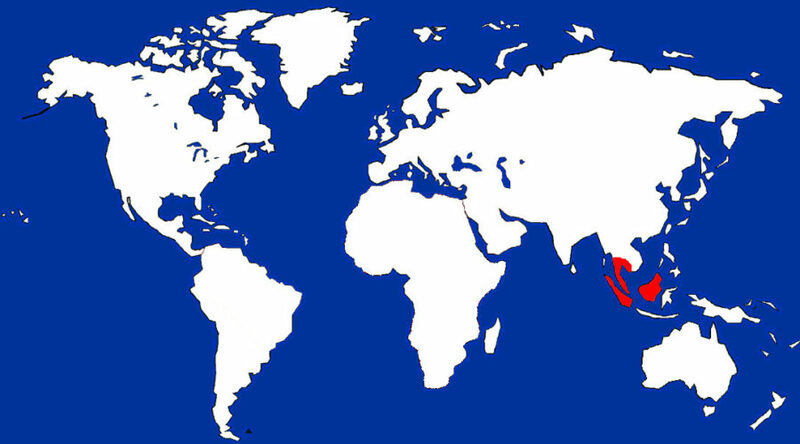 Rainforests – prefers fairly dry lowland forest with plenty of bamboo or palms. The male is metallic green on the back with glossy dark blue chest and belly. The wings are brownish-black. The head is topped with a red crest, a light-colored forehead spot and black bristles on the bill. Females have green bodies with brown wings and a slate-grey head with the dark bristles. The dark green feathers and fan-like orange crest of this species are unique among gamebirds. Both the male and female have a small crest at the base of the beak, but only the male has the bushy orange feathers on top of the head. Like quail and other small gamebirds, the wood partridge lives in small coveys of up to 17 or so birds. These coveys travel the forest, scratching through the soils in search of insects, seeds and fruit. 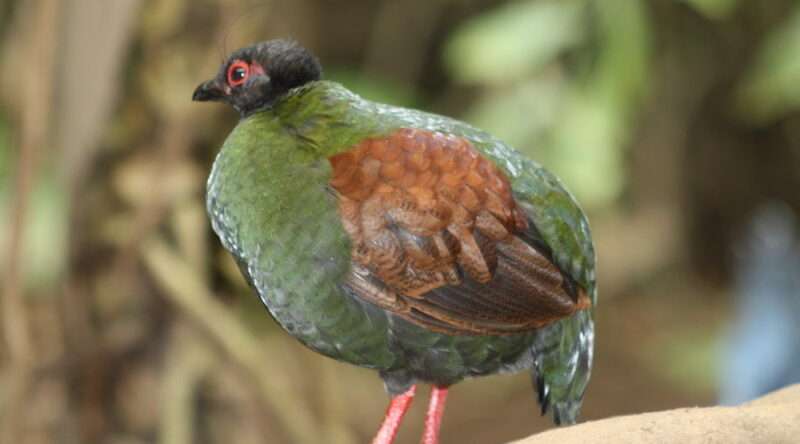 The wood partridge is a noisy bird. Pairs/coveys stay in almost constant communication with one another in a continuous stream of quiet chirps and whistles. The call is a fairly loud, low pitched, sliding whistle. Crested Wood Partridges live in groups called ‘coveys’ of up to 15 individuals. A breeding pair will often dig tunnel-like nests beneath the leaf litter of the forest floor. Chicks are cared for by each parent. In the case of a larger brood, parents may split the group with each parent caring exclusively for half the chicks. Chicks are precocial (fully feathered and able to walk) and are only fed by the parents for a week – after that they are able to forage with the group. Because the bright green color of the female could make her a target during the partridges 18 day incubation cycle, she will cover herself with leaves and dust in order to blend in with the forest floor.